The health and vitality of your clients’ lawns, trees and shrubs are of utmost importance to us. That’s why we’ve truly put Holganix Bio 800+ to the test. Holganix Bio 800+ has been tested by over 28 studies as a soil amendment showing the effects Holganix Bio 800+ has with fertilizer reduction, color and quality improvement and root growth. Researchers at three universities -- North Carolina State University, Penn State University and Purdue University -- studied the efficacy of Holganix Bio 800+ in conjunction with traditional fertilizers and pesticides. And the results were very positive. The university researchers tested the effects of adding Holganix Bio 800+ to a turf maintenance routine. The studies confirmed the benefits of Holganix Bio 800+ with regard to fertility, pre-emergent weed control and post-emergent weed control. Dr. Robert W. Neidermyer, Holganix's Director of Plant and Soil Science, aggregated and reported on the researchers’ encouraging results. Urea is applied as either a slow-release or water-soluble form on turf to acquire optimal color and vigor. University researchers have confirmed that by adding Holganix Bio 800+ to your turf maintenance routine, you can achieve the same overall plant health and color quality with a fraction of the previously required fertilizer/urea. The North Carolina State University study showed that Holganix Bio 800+ reduced the amount of methylene urea required to produce lush green results by 50%. 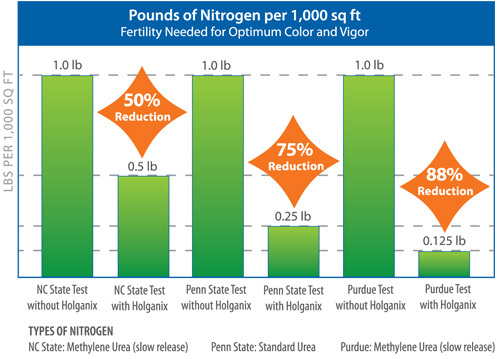 Researchers at Penn State University observed that Holganix Bio 800+ combined with all rates (1.0, 0.5, 0.125 lb/1,000 sq ft) of urea produced greener, better quality turf than urea alone. Purdue University researchers found that Holganix Bio 800+ combined with 0.125 lb of urea produced greening results that were statistically equal to higher rates of urea alone. 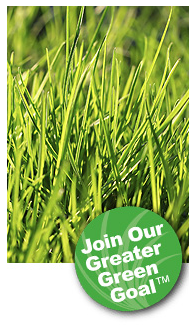 Crabgrass is a naturally occurring but pesky weed. A pre-emergence herbicide can help prevent it for you, but if you add Holganix Bio 800+ to your weed control process, you can actually use less herbicide and create a more natural and eco-friendly turf maintenance routine. Researchers have confirmed the facts. 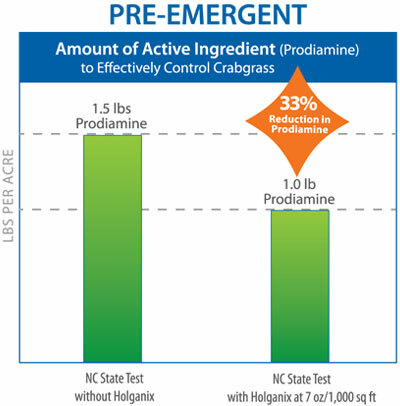 Researchers at North Carolina State University found that when they applied Holganix Bio 800+ they were able to use a reduced amount of prodiamine to obtain satisfactory crabgrass control. Dr. Neidermyer reports that Holganix Bio 800+ combined with 33% less prodiamine produced results equal to those treated at the full-label rate (1.5 lbs per 1,000 sq ft). Dr. Neidermyer's hypothesis is that Holganix Bio 800+ products build biologically functioning soils that promote resilient turf and a deeper, thicker root system. Resilient turf with a deeper, thicker root system is better able to out compete weeds thereby allowing professionals to reduce herbicide rates. 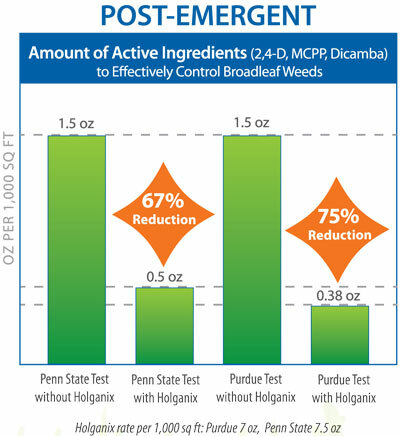 Penn State researchers observed that when using Holganix Bio 800+ alongside a three-way type post-emergent herbicide, the researchers achieved control of white clover at lower rates. In fact, they found that when using Holganix Bio 800+ with a 66% rate reduction of three-way post-emergent herbicide, control of clover equaled the control obtained with the full rate of three-way product without Holganix Bio 800+. In a Purdue University study, by adding Holganix Bio 800+ to the same three-way product, they achieved a 75% reduction while obtaining the same control of plantain as the full herbicide rate without Holganix Bio 800+. As described in the pre-emergence study above, Dr. Neidermyer believes that Holganix Bio 800+ products build biologically functioning soils that promote resilient turf and a deeper, thicker root system. Resilient turf with a deeper, thicker root system is better able to out compete weeds, thereby allowing professionals to reduce herbicide rates. When it comes to your clients’ lawns, trees and shrubs, you want the most efficient fertility and weed control possible. Fertilizers and pesticides can achieve this for you, but by adding Holganix Bio 800+ to your program, you can attain the same plant and turf vigor with less reliance on chemicals -- the way Mother Nature intended. We’re very excited that these studies demonstrate the benefits of using Holganix Bio 800+. This is truly a win for your turf maintenance, sustainability of our industry and Planet Earth as a whole.